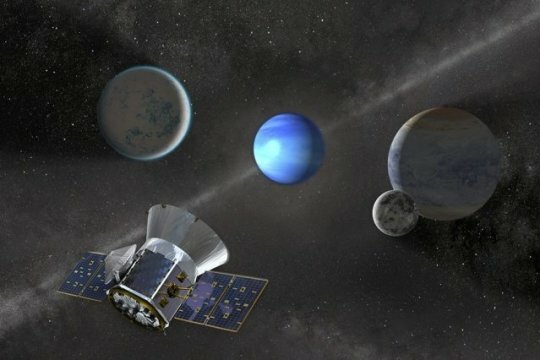 NASA's Transiting Exoplanet Survey Satellite, TESS, has discovered a third small planet outside our solar system, scientists announced this week at the annual American Astronomical Society meeting in Seattle. The new planet, named HD 21749b, orbits a bright, nearby dwarf star about 53 light years away, in the constellation Reticulum, and appears to have the longest orbital period of the three planets so far identified by TESS. HD 21749b journeys around its star in a relatively leisurely 36 days, compared to the two other planets -- Pi Mensae b, a "super-Earth" with a 6.3-day orbit, and LHS 3844b, a rocky world that speeds around its star in just 11 hours. All three planets were discovered in the first three months of TESS observations. The surface of the new planet is likely around 300 degrees Fahrenheit -- relatively cool, given its proximity to its star, which is almost as bright as the sun. "It's the coolest small planet that we know of around a star this bright," says Diana Dragomir, a postdoc in MIT's Kavli Institute for Astrophysics and Space Research, who led the new discovery. "We know a lot about atmospheres of hot planets, but because it's very hard to find small planets that orbit farther from their stars, and are therefore cooler, we haven't been able to learn much about these smaller, cooler planets. But here we were lucky, and caught this one, and can now study it in more detail." The planet is about three times the size of Earth, which puts it in the category of a "sub-Neptune." Surprisingly, it is also a whopping 23 times as massive as Earth. But it is unlikely that the planet is rocky and therefore habitable; it's more likely made of gas, of a kind that is much more dense than the atmospheres of either Neptune or Uranus. "We think this planet wouldn't be as gaseous as Neptune or Uranus, which are mostly hydrogen and really puffy," Dragomir says. "The planet likely has a density of water, or a thick atmosphere." Serendipitously, the researchers have also detected evidence of a second planet, though not yet confirmed, in the same planetary system, with a shorter, 7.8-day orbit. If it is confirmed as a planet, it could be the first Earth-sized planet discovered by TESS. In addition to presenting their results at the AAS meeting, the researchers have submitted a paper to Astrophysical Journal Letters.